WASHINGTON (Sputnik) - US President Donald Trump told reporters on Air Force One that he will discuss during a meeting with Russian President Vladimir Putin Moscow's alleged interference in US elections. "Ukraine, Syria, elections… we don’t want anyone tampering with elections," Trump said as quoted by the pool on Friday when asked about his agenda with Putin. Kremlin spokesman Dmitry Peskov said earlier in the day if Trump raises the issue of Russia's alleged meddling in the US election at talks in Helsinki, Putin will be ready to once again deny it. The US intelligence community concluded in January 2017 that Russia attempted to influence the November 8 elections and help then-candidate Trump to win against his Democratic rival Hillary Clinton. Moscow called the allegations absurd and said Russia does not interfere in the internal affairs of other states. Kremlin officials also said the allegations are an attempt by US politicians to distract from domestic problems and an effort by the US media to demonize Russia. Trump also suggested that scrapping sanctions on Russia depended on its actions, including in Syria. Asked about potentially lifting sanctions on Russia, Trump told reporters, "We'll see what Russia does. We're going to be talking to Russia about a lot of things. We're going to be talking to them about Syria." Also, asked if he would recognize Crimea, which rejoined Russia in the spring of 2014 after referendum, as Russia, Trump told reporters "we're going to have to see." He also said not to forget that President Barack Obama "gave up" Crimea. The Russian-majority region voted by a landslide in 2014 to secede from Ukraine after a coup in the Eastern European country brought nationalists to power. Kiev's Western allies refused to recognize the outcome and imposed sanctions on Russia and separately on Crimea. During his 2016 election campaign Trump hinted at a possibility of recognizing Crimea as part of Russia but has since backtracked. 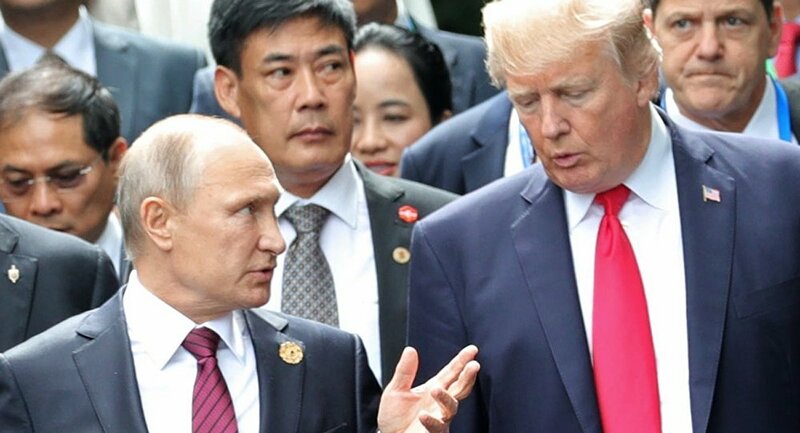 Trump is scheduled to hold a summit with Russian President Vladimir Putin on July 16 in Helsinki, Finland.